Kodi, the most popular media player app around the world which provides access to all kinds of Video, Audio and Live TV online streaming has a latest update available for you that you must install and download to enjoy HD TV at its best. To update the latest version of Kodi on different Operating Systems sometimes seems to be a tedious task to perform with all the errors that seeps in while configuring the said installation of the latest version. There are various firms nowadays which provide Amazon Fire Tv App Development Services to those businesses around the world which are directly related to Video Streaming Sphere. Here I am guiding you with the most easy-to-follow steps to download and install the latest version of Kodi i.e. 16.1 . Firstly, you need to visit the Kodi Downloads Page and then simply select the Windows installer and follow the steps as per the wizard and it will itself guide you towards the complete installation process. Upgrading the software is the same as you had done earlier, it’s almost the same process like the one with previous version. The Automatic built-in-updater is not supported with Kodi, so, you need to download that version from the Kodi site which says Kodi 16.1. Hence, the previous version will be automatically replaced by the new version automatically. Upgrading to the latest version of Kodi on an Android device is actually quite simple and sometimes also automated (if you have set your device to auto-update apps). If in case, the settings on your device has not been put on Auto-Update Apps, then simply open the Google Play App and search with the name Kodi. Once the Kodi app appears on your device screen, tap on the update button to get your Kodi App upgraded to latest version. 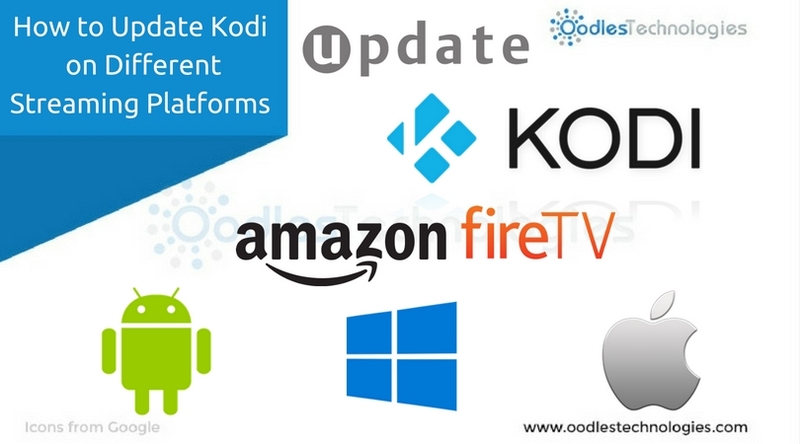 To use the latest version of Kodi using your Amazon Fire TV Stick, you need to reinstall it completely as the Auto-update feature is not available with Fire TV stick as well, much similar to the Windows upgradation. The latest stable Kodi APK for Android ARM architecture must be downloaded first. You can do this by opening up the Kodi’s download page and then you need to select it under the Android logo. To sideload Kodi on your FireTV, downloading and installing a tool is mandatory. We can use adbFire App which will be compatible with PC, Linux and Mac. Or download a tool using this link. The compressed folder should be extracted to your preferred place on your PC. You can also extract it on your desktop as this is the most comfortable option. Now, when you have opened Amazon Fire TV and is plugged in and running, go to Settings and then Developer Options and put ADB debugging to On. Kodi will now be giving you access to install it. Installing Kodi to your FireTV requires the IP address to be known. You can find this by following : Settings > About > Network . Jot it down to be used later on in the process. Now, the extracted adbFire folder should be opened and run or launch adbFire.exe from applications if you are running a Mac. A new Fire TV device profile should be created by clicking on New . For setting up a new device, now you need to fill the form which will appear in front of you giving it a name and also put in the IP address which you have already jotted down earlier in the process. Leave the rest as Default and click on Save. Now your device has been added to adbFire, select your device in the Current Device List and tap on Connect to continue. The Device's IP address will now appear under the connected devices. Tap on install APK and now you need to browse to the destination where you downloaded Kodi in the step 1 of this process. Select it and the progress bar will be completed within a few seconds, wait till that time. Now, a confirmation message will appear after the successful installation of Kodi on your Amazon Fire TV. After finishing the installation, simultaneously press Select and Play option on the remote for at least 5 seconds to make it reboot. Don't expect a Kodi icon on the screen as Fire TV doesn’t show icons for sideloaded apps. Launch Kodi by following this : Settings > Applications > Manage All Installed Applications. Select Kodi by scrolling down and now click on the Launch Application option and that’s it. You are done with the installation of the latest version of Kodi ! To upgrade Kodi on a Mac, follow the same procedure as in Windows. Just need to replace the current version with the new one i.e. 16.1. To do that , visit the Kodi Downloads Page and choose the OSX installer, then you need to launch the package which get downloaded for you and now follow the instructions given to you. Hope this will help you in the easy installation process. Amazon Fire Tv Live Streaming Services are very popular because of the unmatched lag-free live video streaming services Amazon provides to its users.